Thanks to Jack Good himself, we now have the rehearsal schedules for the two trial "Oh Boy!"shows. They were shown only in certain regions of the UK on Sunday 15th and Sunday 29th of June 1958 going out at 10.50pm. **As you will quickly notice, all the artists rehearsed their songs about three months before the shows were actually televised, therefore it is still uncertain as to whether ALL of the listed artists DID appear. It is possible that one or two dropped out before the shows went on air, to be replaced (or not) by other singers such as Dudley Heslop (Cuddly Dudley) for example. As more information comes to light, the website will be updated. 9.30am. Vernons Girls, Dallas Boys, Jackie Dennis, Marty Wilde, Kerry Martin. 1.00pm. Lord Rockingham's XI, Jackie Dennis. 1.30pm. Vernons Girls, Dallas Boys. 1.45pm. Marty Wilde, The Cutters. 2.45pm. 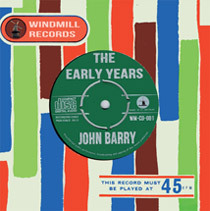 John Barry Seven, Kerry Martin. 3.30pm. Lord Rockingham's XI & Bertice Reading leave, rest of cast continue. Second Eleven: Dallas Boys, Cliff, Marty etc. and the rest of the cast. The first rehearsal for the new series of “Oh Boy” was held at the 'Four Provinces of Ireland Club' at 13, Canonbury Lane, London N1, for the entire day on Tuesday 9th September 1958. All the cast had to be set up and instruments tuned in time for the 10am start and the rehearsals lasted until 6pm that evening. The schedule below was for the complete first show and the lion’s share of the second. 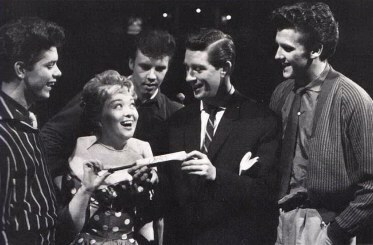 Lord Rockingham's XI, who formed the musical backbone of the series, had to plan more in advance than some of the self contained groups like Cliff Richard and the Drifters or solo artists like Cuddly Dudley, hence they are strongly represented in this initial rehearsal with ample material to fill the two weeks. 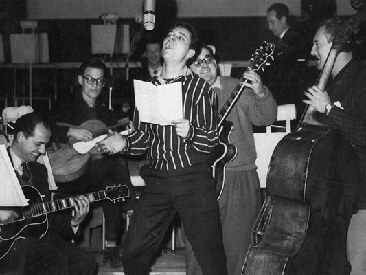 In the following week, Cliff and the Drifters returned to practice the songs for their second show (unknown) and artists like Cuddly Dudley would arrive clasping their written arrangements to practice with the band. As in this initial rehearsal Cliff and the Drifters would be the first to set up and practice their standard two numbers in just half an hour in order to clear the decks for the big band rehearsals of Lord Rockingham's XI. 10.00am. Cliff Richard & the Drifters 1.Don’t Bug Me Baby 2.Move It! 10.40am Marty Wilde & Dallas Boys MEDLEY: Baby I Don’t Care/ Think It Over/ Poor Little Fool /Rocky Road Blues. THE SCHEDULE , SECOND REHEARSAL Saturday 13th September 1958 Hackney Empire. Transmission Time: 6.00pm. Thanks for the reply regarding London showings of the pilots. I thought I was going mad. And also pleased to hear it is showing just the two figures in spotlight, but are we sure it`s Jet and Tony? I wasn`t up on everything back then but I was under the impression that the one playing the snare drum (no other items of the kit used) on those very early transmissions was Terry Smart (in sunglasses) and that the guy playing the Framus Star Bass wasn`t yet Jet but Ian Samwell. Any thoughts. I`m happy to be proved wrong. Let`s hope we can get copies. I am about to send off copies of the two earlier shows to Cliff who, amazingly, does`t have them. And of course when/if I can get my hands on the new find I have promised to get that to him as well. It's now changed to "... were shown only in certain regions of the UK..."
I have just read the info that the two pilot shows were aired only in the Midlands and I have to take issue with that. I distinctly recall watching the first pilot which came on the screen devoid of any prior publicity. It was a big surprise to me. And yes, I remember it was late at night. I recall it being a Sunday night but it maybe been perhaps a Saturday. I certainly wasn`t in the Midlands at the time. In fact I had barely been out of Middlesex as I was only 14/15 bak then. 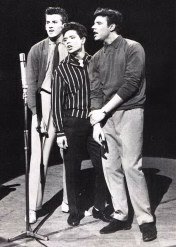 I also remember being surprised by the opening song (by Marty Wilde I think) was odd because I expected the first song to be Oh Boy, which it wasn`t. Is there anyone else in the South who remembers seeing either of the pilots? It seems we now have three of the shows recorded. As many of the shows were sent abroad for foreign transmission I imagine and hope that there may be others that have survived and are waiting in some archive to be rediscovered. It was a magical show for we young rock and roll fans.